According to Searching, there is an inquestion:this operator to search for answers within the question itself. This is useful for questions with answers that span multiple pages. However, it seems that this is currently malfunctioning and I was unable to get it to work. Example post used: Why is it faster to process a sorted array than an unsorted array? Incorrect results are shown for inquestion:this fail when on the question itself. If the question ID is used instead, inquestion:11227809 fail - the expected results are displayed. This issue was detected while development of my "Advanced Search Helper, Saved Search (Bookmarks), and Navigation Improvements" userscript, which builds advanced search queries. Thanks for pointing this out. We are restructuring our index and in doing so accidentally broke this functionality. It has now been fixed. Not the answer you're looking for? 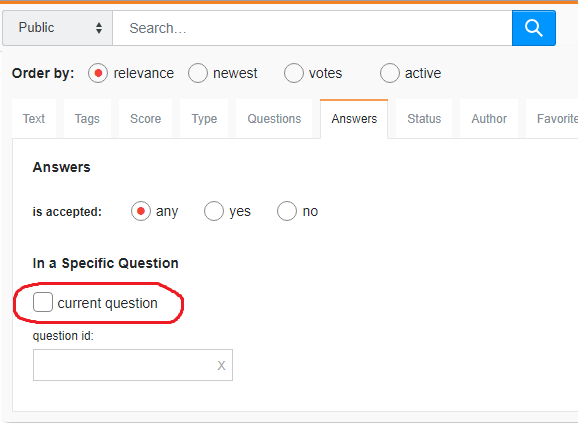 Browse other questions tagged bug status-completed search search-box .